Wahoo! 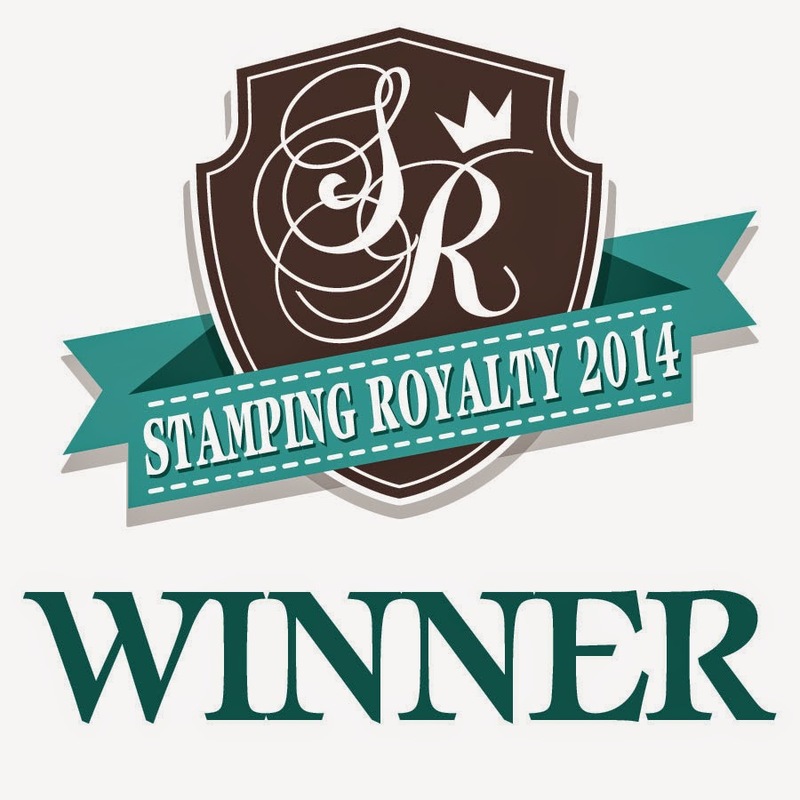 It's time for another Your Next Stamp Digi Release!!! 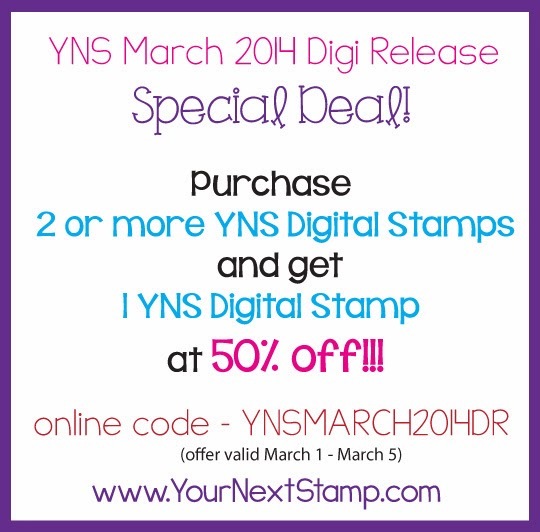 Welcome to the April YNS Digital New Release! We are so happy to have you join us as we showcase our new images from Penny and Laurence of Omnia Designs!! The party begins on Anita’s Blog and guess what?! 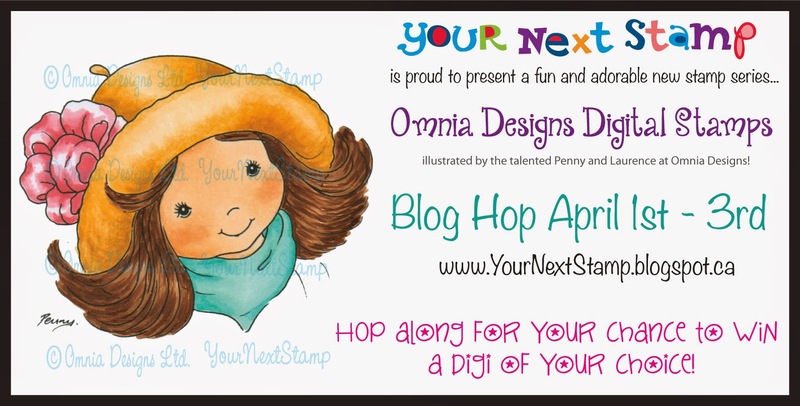 We'll be giving away 5 digi stamps from the stops on the hop, so be sure to leave comments along the way for your chance to WIN!!!! Winners will be announced on April 4th on the YNS Blog. This happy little digi is called Surprise and I totally love it! I have three boys, so this image really calls out to me. I colored it with copics, adding a dotted background again because they are SO fun (you really should try it!)!! Here's a look at the full card. I used Karen Giron's SSSC213 sketch. 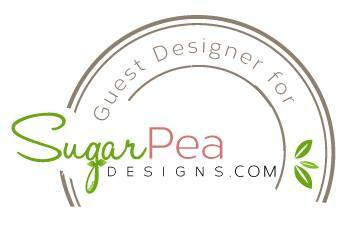 The banner was a must, which I created with die-namics and white twine. The larger panel and digi are both up on foam adhesives. I used several die-namics (circle STAX, mini pennants, and Blueprints 13 to name a few) and finished it up with two big silver brads. And as always, Karen has an awesome deal for YOU! Thanks for stopping by! Now go enjoy the rest of our awesome hop with these talented ladies!!! Hi all! TGIF!!! It's YNS Fun Friday Challenge and Sister Act Card Challenge time! I used the YNS March sketch for this card. This darling little digi image is called A Flower for You. I colored it with copics and added a dotted (or is it stippled or is it pointilism?) background. The banana split card base measures 4 1/4 x 4 1/4 square. The image was cut out with one of the elements from the Blueprints 1 die-namics and then matted on gumdrop green card stock. The scallop edge was created using one of the elements from the Blueprints 9 die-namics, as well as the stitched striped yellow dp layer. The sentiment is from the SugarPea set, Love You Bunches. A trio of sour apple buttons, a little distressing, and some corner brads add the finishing details. BE sure to play along for your chance to WIN! Thanks for stopping by! Hi all! Here's a quick Clean and Simple card I made for the CQC234 challenge and also the Retro Sketches #107. I love that these colors give this such a modern feel. I used the LJD Splendid Sunflower set with matching die-namics. I used safety orange, brick red, and blu raspberry inks and then steel grey card stock to get all the colors from the challenge on here. The card base is smooth white and measures 4 1/4 x 4 1/4. The steel grey card stock was cut out with my Square STAX. The sentiment is from the new Birdie Brown set, Sunflower Sweetheart (which is currently unavailable but click on that handy Notify Me button and they'll email when it's back in stock!). Hi all! 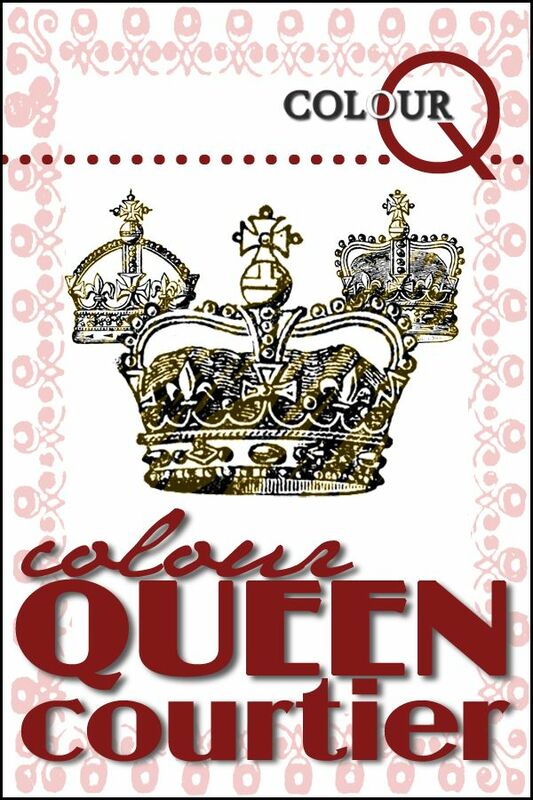 I wanted to share this card I made for the Colour Q Challenge #233 and also the SSSC212 sketch challenge. I kept it super clean and simple. The only stamps I used were the DC Striped Backgrounds in grout gray on grout gray card stock. The 'hello' is from Happy Hellos die-namics, which I cut out with smooth white card stock and popped up on rolled up glue dots. The vertical strip was cut from Blueprints 12 and the horizontal strip is from Blueprints 1. A trio of enamel dots add the finishing details. Hi all! 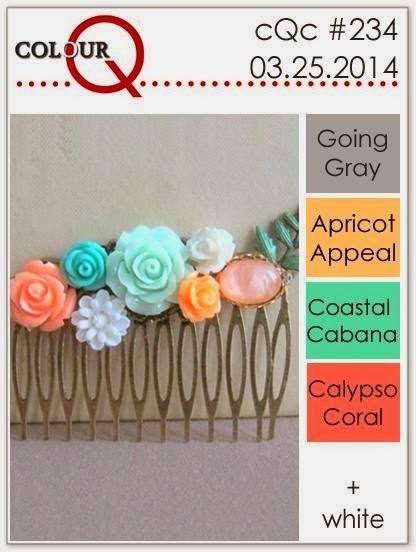 I wanted to share this card that I made for the latest MFT Color Palette Challenge 3 and the MFTWSC168 sketch. I couldn't wait to color this image from the new set, Sunflower Sweetheart by Birdie Brown! She's a good-sized image which I just love, more room to color or paper piece! I used my E33 colic to make her a "straw hat". 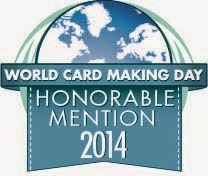 Here are the die-namics used on this card: blueprints 13, blueprints 1, blueprints 12 (uh, yea, I love my blueprints! ), and circle STAX 1. The sour apple rectangle was stamped with washi patterns and popped up on foam adhesives. The skinny kraft layer on the right was stamped with the woodgrain background stamp. I also added a bit more dimension in the area of the main image with some modeling paste and my MPD Scallops stencil. The stitched circle and card base are grapesicle card stock. Here's a close up where you can see the dimension from the foam adhesive. Hi all! 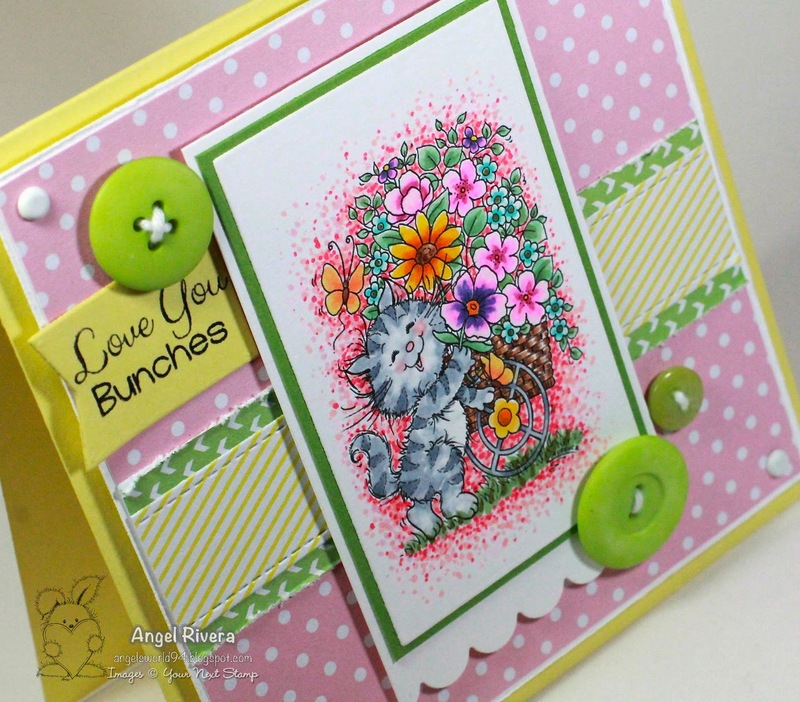 Here's my card for the newest YNS Fun Friday challenge (I used the Inspiration pic - love those colors!) and the anything goes SACC challenge. 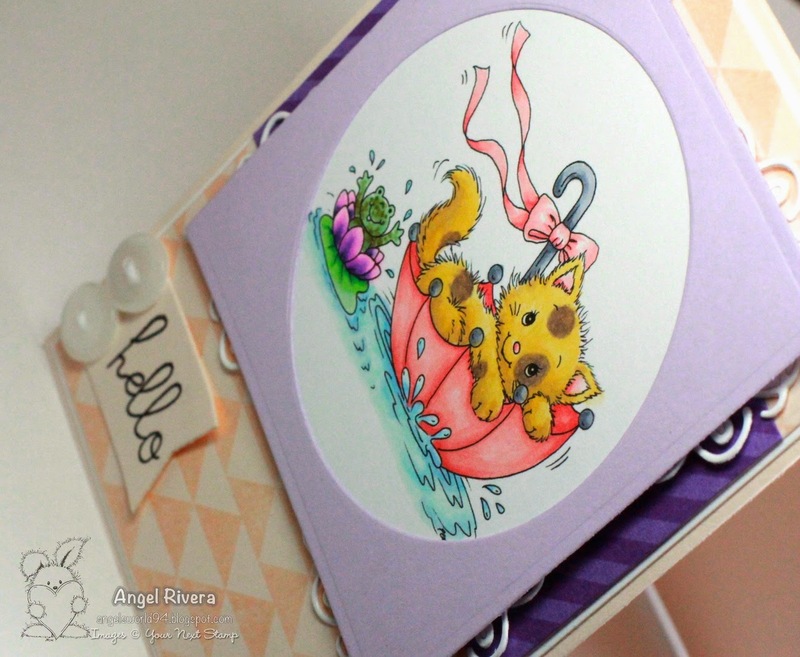 This darling image is a newly released YNS digi called Floating down the river. I colored it with my copics, of course, adding some 'warts'(or maybe I should say freckles because he's too cute to have warts!) to the little frog, hehe. 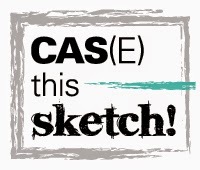 The sketch is from the SCS DD Monthly Theme, which you can only view is you're a member, which I HIGHLY recommend! (I've been a member for oh, about 6-7 years!) The sentiment is from an MFT set. I also used the Jumbo Mod Borders on the Insulation Pink layer and Striped Backgrounds on the little bit of grape jelly card stock (behind the main image). 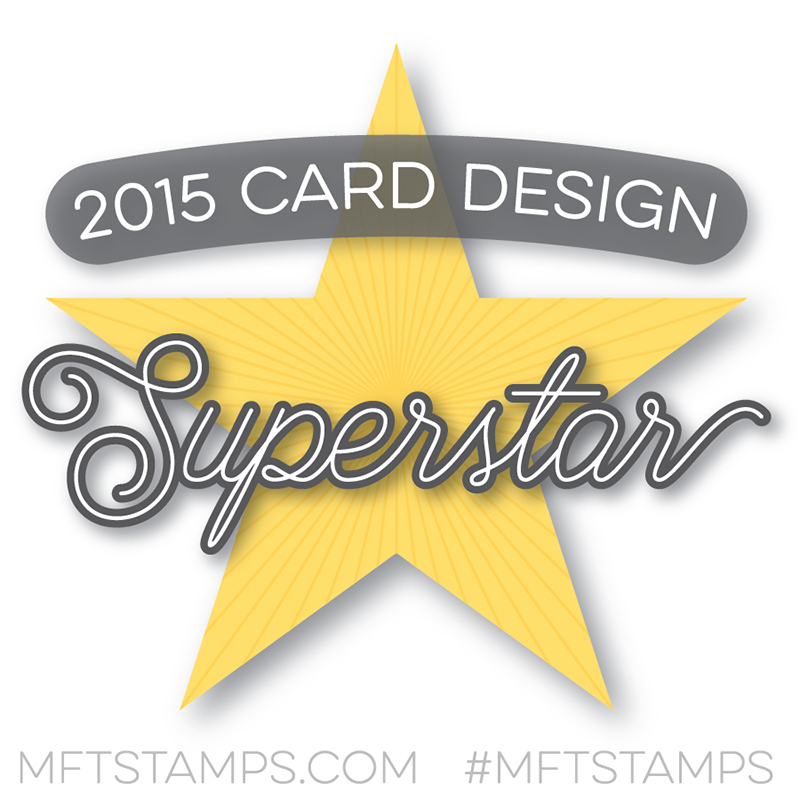 I am loving the Four Corners die-namics from MFT! They add such a nice touch. A couple of buttons with twine add the finishing details. Thanks for stopping by! Be sure to PLAY ALONG for a change to WIN!!! Hi all! 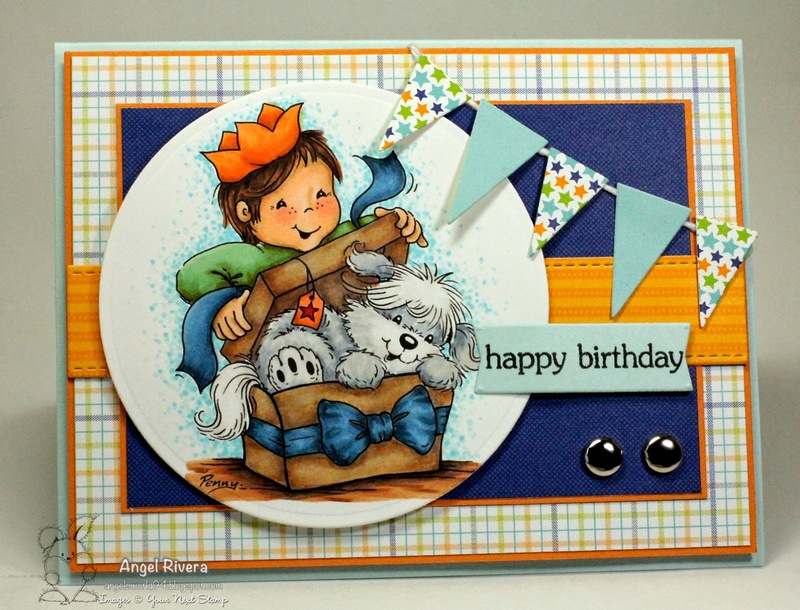 Here's my card for the latest MFT sketch, MFTWSC167, and for today's Ways to use it challenge on SCS. When I saw the challenge on SCS, I almost immediately knew what I wanted to create and am so happy with how this turned out! First off, I used the MFT Polka Dot Cover-Up die-namics to cut out the smooth white card stock, along with grape jelly, nightshift blue, gumdrop green, lemon drop, orange fizz and electric red card stocks. Once I cut it out, I adhered the smooth white layer to a thin piece of copy paper so that I had a background to adhere all the other colors to - after that it was just a matter of adding the colors how I wanted! SO fun! The entire polka dot layer is up on foam dimensionals. 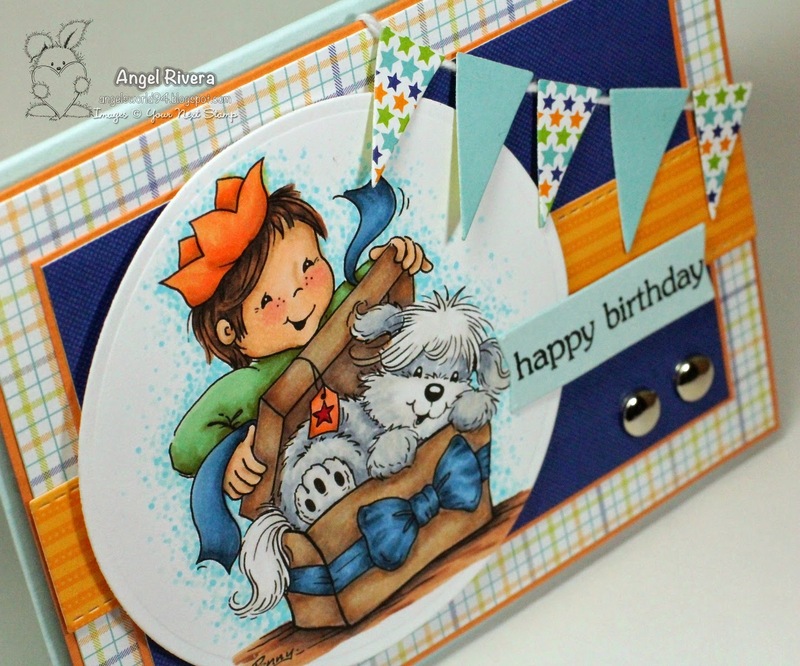 The sentiments are from their Celebrate Big stamp set. "Celebrate" was stamped in grout gray and the other one was stamped in Steel Grey. I cut it out using my Fishtail Flag STAX (no surprise there!) and ran it through twice to get that cool fishtail edge on both side. I adhered it with foam dimensionals on either end leaving the middle free so it looks like a waving banner. Because all the colors make this card so fun and bright, I only added a few mini brads as extra embellishments in purple, yellow and orange. Hi all! Here's my card for the latest sketch challenge at MFT - MFTWSC166. I thought this big, bold sunflower would like great in the center of the circle layer, so I used LJD's Splendid Sunflower set. I stamped it with lemon drop ink. 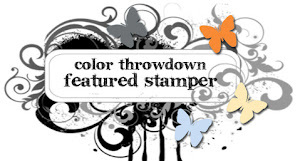 The center was stamped with chocolate and hot fudge inks. The leaves were stamped in jellybean green. The sentiment is from, I believe, a now retired MFT set, which I embossed using black ep on a strip of vellum. That cool background was done with the fishnet cover-up die-namics - love! I used some nightshift blue card stock behind it to make the fishnet design really stand out. A trio of fuse green buttons with thread finish it up. Hi all! I saw this challenge for the new Mix-Ability challenge on SCS and decided it would be fun to try it out! 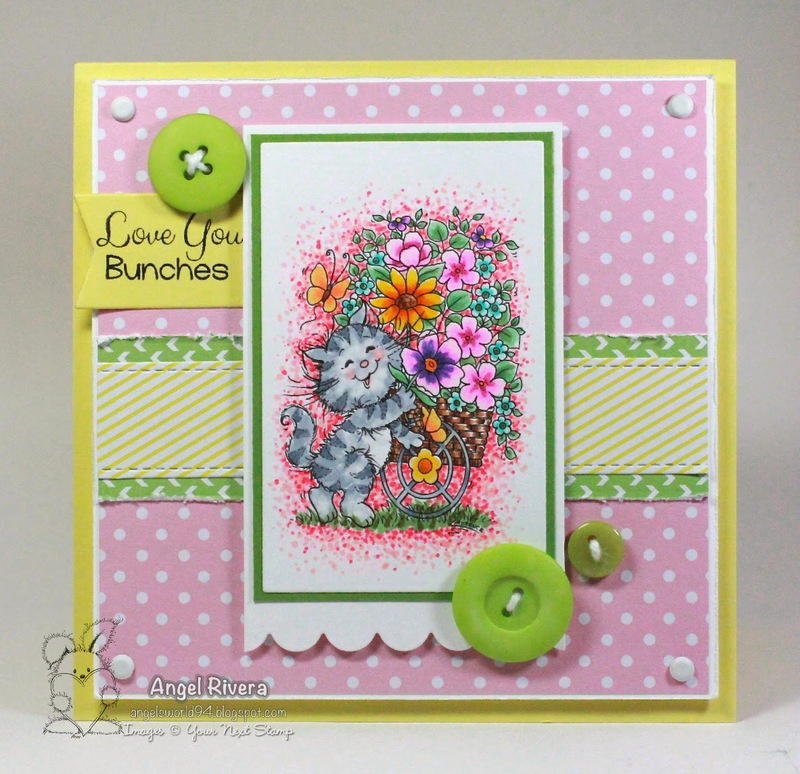 So, as per the challenge, the background for my sentiment was done using lemon drop, orange fizz and razzle berry inks because I wanted to make a bright and happy card to go with my sentiment. ;) I inked up one of my acrylic blocks, used my aquapainter to get my watercolor paper damp, and then swiped on the inks one at a time until I got a look that I was happy with. I cut out my finished piece with my pierced circle stax and stamped my sentiment from the Chalkboard Greetings set in black licorice. I pierced the larger layer and did some faux stitching with my black SU marker. 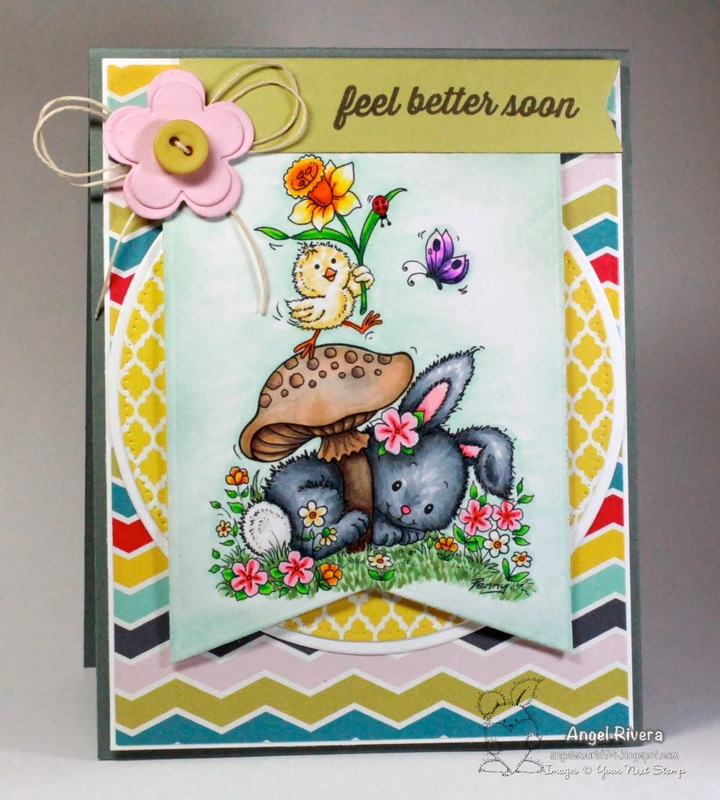 A large leaf-filled flourish die-namic helps break up the brightness of the lemon drop card stock and also grounds the sentiment layer. 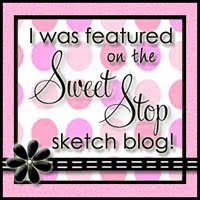 The sketch is based off the SSSC209 from Karen G.
Your Next Stamp March Blog Hop! Hi all! 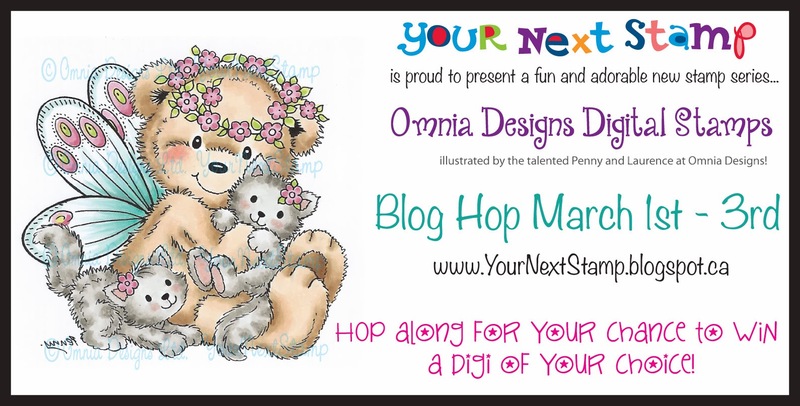 Welcome to the March Your Next Stamp March Blog Hop Digital Release! We are so happy to have you join us this month! We have 9 BRAND NEW EXCLUSIVE Digital Images from Penny and Laurence of Omnia Designs! This month, the hop begins on Design Team member, Bonnie's Blog - click on her name to get back to the beginning of the hop! We appreciate you hopping to each blog listed below - just click on each picture and leave a comment to win some digital prizes! Winners will be announced on the YNS Blog on March 4th! On to my card... 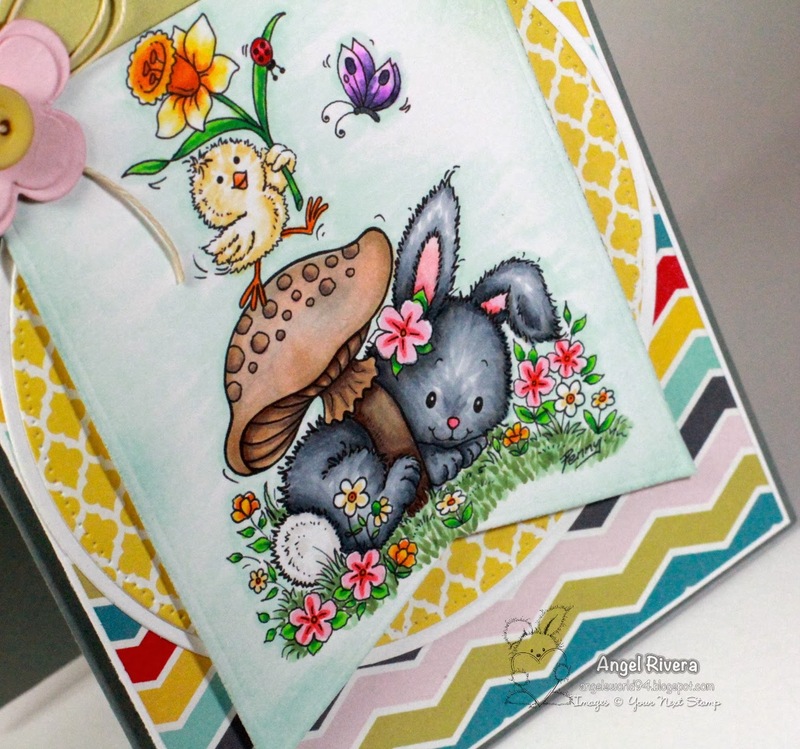 This ADORABLE image is called Sweet Spring which you can find at the YNS store NOW! I colored it with, yep, you guessed it, copics. ;) I used my BG10 copic to add shading around the image and also sponged sno cone ink around the edges for more of a "sky" look. The sketch is my take on the current Deconstructed Sketch, DS140. Lots of die-namics, to include a button-centered die-namic flower with hemp thread and a sentiment banner, finish it all up. Thanks for joining us this month! Now click on the pictures below to see all of my teammates and guests designers lovely projects!